If you make the effort to lug these items around in your bag then you know that they are special and worth mentioning. 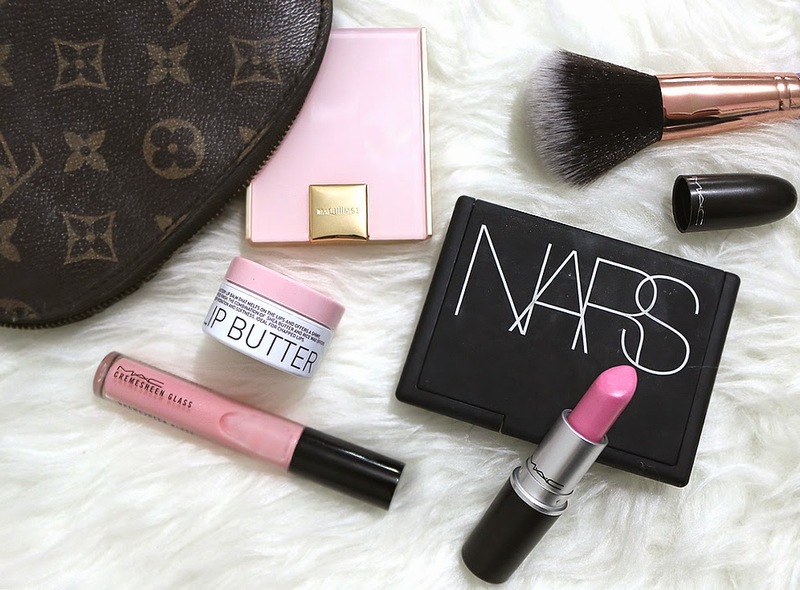 Let me give you a peek into what's inside my purse makeup bag and show you the five essentials I carry around with me daily. I bought this piece to match the bag I use most, my Louis Vuitton Neverfull MM, and if any of you reading own it then you would know what a struggle it is to find anything in there. Having a cute little cosmetic pouch like this makes it easy to reach in and grab it as well as keeps all of your beauty goodies in the one place. I adore this palette for on the go since it contains enough eyeshadows to create a full eye look but is quite small and doesn't take up a lot of room in the makeup bag. It's also great because you can create both day and night eye looks depending on the occasion. This makes it perfect for office workers who may want a neutral eye for work then a smokey eye for dinner or a party afterwards. This is my go-to lip colour because it's the perfect in between of casual and dressy since it's a light candy pink with a bubble-gum pink undertone. I know that this lipstick instantly turns me from drab to done up and it's a great formulation to work with, meaning you don't need a mirror for application. Sometimes you need a slick of lipgloss to take on the day and I love pairing this one over Pink Nouveu so it's the perfect duo to keep in my makeup bag. You could also wear this one on it's own for a neutral colour with a bit of shine. An absolute essential is lip balm and I keep one in my car, on my desk, of course in my handbag and anywhere else I might need to give my lips some moisturising. My current lip balm favourite is the Korres one because it's such a beautiful consistency and soaks into the lips really quickly so you can then apply lipstick and gloss. Something I always love having on hand is a pressed powder or a blotting product of some sort. If your foundation starts to look a little dodgy mid-way through the day then you can just get this product out, buff it into your foundation and it really refreshes your whole look. I hope you enjoyed peeking into my purse makeup bag and seeing some of my everyday essentials I have with me. If you want to learn more about these products, you can click the review or buy links next to the product name.